The Prime Minister, Shri Narendra Modi, today dedicated the world’s tallest statue, the ‘Statue of Unity’, to the nation. The 182 metre statue of Sardar Vallabhbhai Patel, was dedicated to the nation on his birth anniversary, at Kevadiya in Narmada District of Gujarat. At the launch ceremony, the Prime Minister and other dignitaries’ poured soil and Narmada water into a Kalash to mark the dedication of the ‘Statue of Unity’ to the nation. The Prime Minister pressed a lever to commence a Virtual Abhishek of the statue. He inaugurated the Wall of Unity. 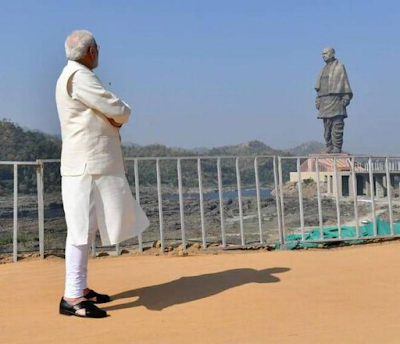 At the feet of the Statue of Unity, the Prime Minister performed a special prayer. He visited the Museum and Exhibition, and the Viewers’ Gallery. This gallery, at 153 metres height, can accommodate upto 200 visitors at one time. It offers a spectacular view of the Sardar Sarovar Dam, its reservoir, and the Satpura and Vindhya mountain ranges. 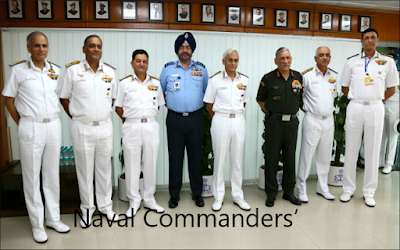 The dedication ceremony was punctuated by flypast of IAF aircraft, and performances of cultural troupes. He said today marks a special moment in the history of India. 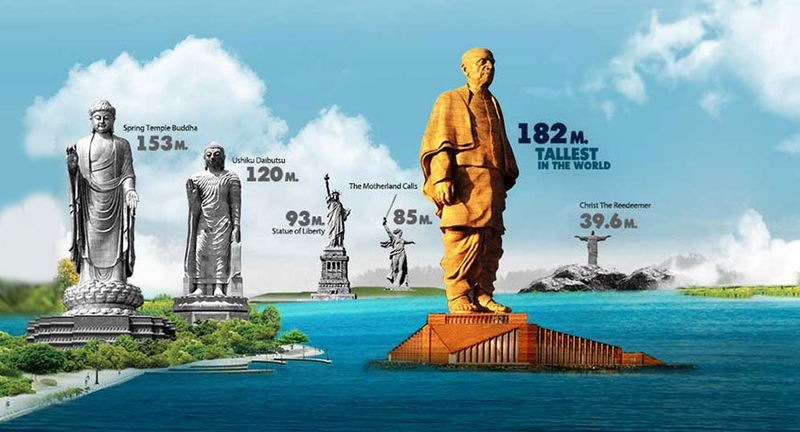 He said that with the Statue of Unity, India has given itself today, a towering inspiration for the future. He said the Statue will continue to remind future generations of the courage, capability and resolve of Sardar Patel. He said that the integration of India by Sardar Patel, has resulted today in India’s march towards becoming a big economic and strategic power. The Prime Minister also recalled Sardar Patel’s vision of the administrative services as a steel frame. He described the Statue of Unity as a symbol of the self-respect of the farmers who gave soil from their land, and iron from their farming implements for the Statue. He said the aspirations of the youth of India can be achieved only through the mantra of “Ek Bharat, Shrestha Bharat.” He congratulated everyone associated with the construction of this Statue. He said the Statue would generate considerable tourism opportunities for the region. The Prime Minister mentioned that several memorials have been made to recall the contributions of freedom fighters and great leaders, in recent years. Besides the Statue of Unity, he mentioned the museum dedicated to Sardar Patel in Delhi, Mahatma Mandir and Dandi Kutir in Gandhinagar, the Panchtirth dedicated to Babasaheb Bhimrao Ambedkar, the Statue of Sri Chhotu Ram in Haryana, and the memorials of Shyamji Krishna Varma and Veer Nayak Govind Guru in Kutch. He said work is in progress for the museum dedicated to Subhash Chandra Bose in Delhi, the Shivaji statue in Mumbai, and tribal museums across the country. The Prime Minister spoke of Sardar Patel’s vision of a strong and inclusive India, and said the Union Government is working towards making this dream a reality. He mentioned the efforts to provide a home to all, to provide electricity to all, and towards road connectivity and digital connectivity. He also mentioned the Pradhan Mantri Jan Arogya Yojana. He said that efforts such as GST, e-NAM, and “One-Nation, One-Grid” have also contributed to integrating the nation in various ways. The Prime Minister spoke of our collective responsibility to maintain the unity and integrity of the nation, and to counter all divisive forces.